When you need a gift that you want to impress the receiver, they'll enjoy the presentation that this basket offers. The dipping dish is one of my favorites. Balsamic is heavier and will sit in the grapes when poured, the olive oil will be on top. Voula enjoy the look and the taste. 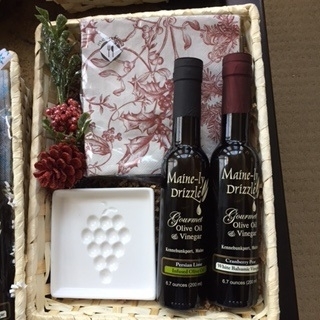 This basket comes with 6.7 oz bottle of Cranberry Pear Balsamic and 6.7 oz bottle of Persian Lime Olive Oil. The combination is great on chicken, vegetables and any type of salad or for dipping bread. A package of season appropriate dinner napkins are included; this basket is beautifully decorated with seasonal items.